Well only 6 months since my last post then............! Firstly 'Hi' to my nephew Richard, who thought I had dropped off the planet and taken my blog with me. 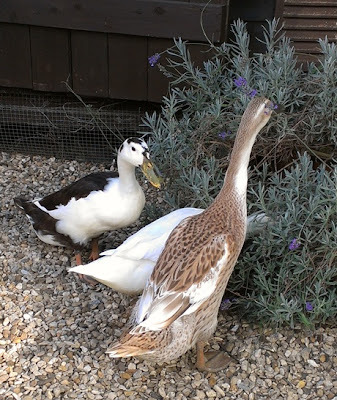 So......we are now owned by three Runner ducks, seen above and below. We've had them since they were 10 weeks old. 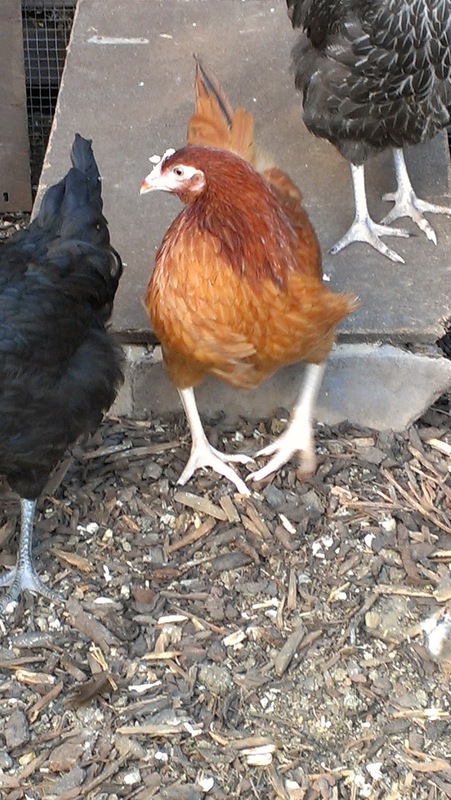 Left is Tiggy (chocolate magpie) then Daisy (white) and then Beatrix (fawn). They are certainly entertaining and rather hyper. 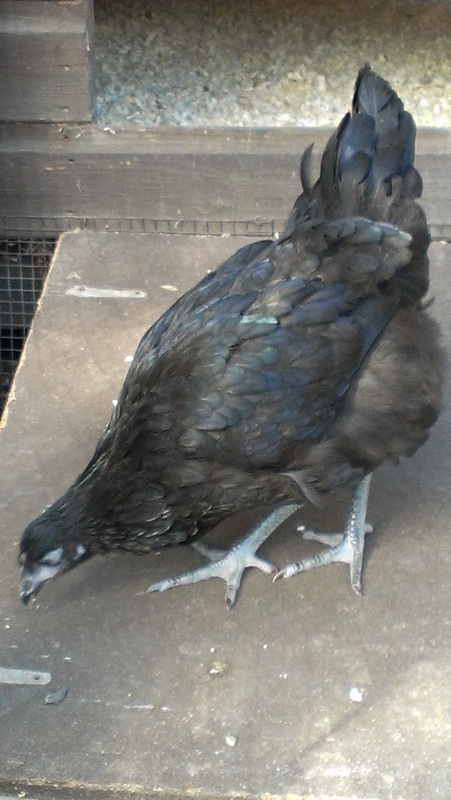 Rather more hyper than I had expected, but to be fair to them they are still only 6 months old and yet to lay. They are usually running around the garden, bolt upright (as is the Runner duck stance) and rootling through the grass. 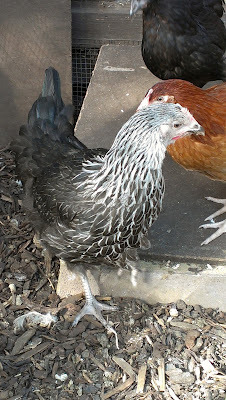 They rootled through one of our hens feathers the other day while she was dust bathing. She was quite befuddled as to what was occurring! I'm made the hard decision to take a long break from bearmaking. Although I would get great feedback and lovely comments (Facebook and such) sales just were not happening anymore. As much as I would love to churn out bear after bear, I obviously need to sell them. I may come back to it in the future, with perhaps a brand new look! I still have bears available on my website at www.sarahsbruins.co.uk. If you would like to take a peek. The silver lining is that I've returned to my first love of drawing! (see cockerel above). It was strange to be picking up a pencil and applying it to that bright white empty page. I've been picking up fabric and scissors for 12 years before now! It's lovely to be drawing again and my confidence has had a boost by a local picture framers saying he would take some of my work to sell in his shop! Just need to find the time to knuckle down a bit more! Above are our new hen additions! Top is Delilah, below her is Florence and then there's Bibi. They are only 18 weeks old and still 'springy' and 'bouncy' and inquisitive about everything! Our other 7 hens are still putting them in their place, but this will calm down in time. We had a sad loss of two hens a little while back. Lettuce (cream coloured hen) developed Egg Yolk Peritonitis, of which there is really no cure, so she was put to sleep. We were heartbroken to lose suddenly our little Chick, who one of our hens hatched from an egg. The only one to hatch from 12 eggs. She was 2 years old and full of life until she suddenly became ill one evening and by the morning we had lost her. 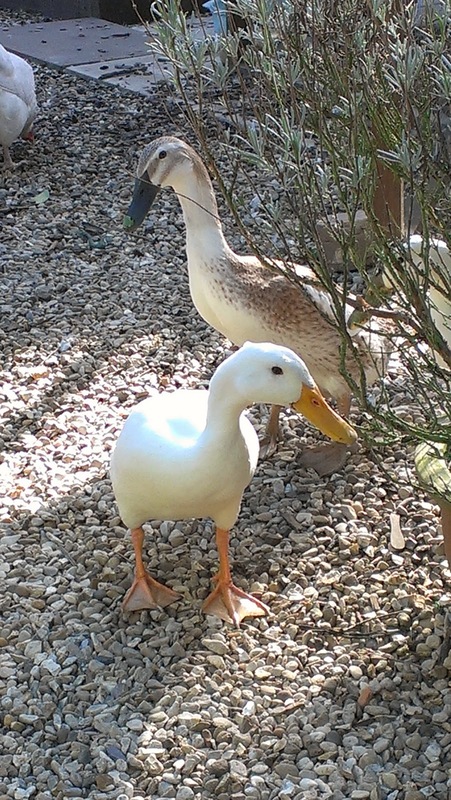 It's a tough time when we lose our furry and feathered family members. There's nothing as exhilarating as trying something new! This little man has been sat in a bag, alone, unjointed and dejected. His muzzle didn't turn out as planned and in a fit of pique I gave up on him. 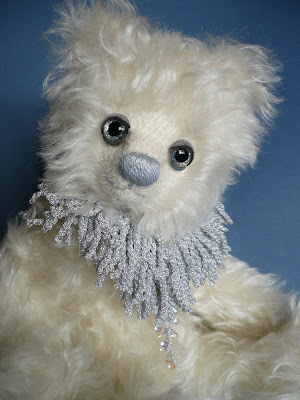 After seeing wonderfully skilled Teddy Bear Artists who create needle felted muzzles, I thought I would resurrect him and give needle felting a go. I must say I am rather enjoying stabbing away - much to my Robert's amusement! Those needles are lethal though and I've already gained superficial 'stabs', although nothing deep, I can well imagine how a proper jab would feel! Like a fool, I ordered two colours with specific bears in mind, forgetting they would need noses (needle felted), so that was corrected yesterday by ordering some browns and greys and trying to not get carried away with the plethora of colours on offer. I've yet to decide if 'Winter' on my website will have a makeover. After all, once started there is no going back! I will post my progress here with my needle felting foray. Well, 'that all folks'! For now anyway. Winter sadly didn't find a home on ebay. He is now back on my website reduced from £120.00 to £100.00. Sunshine here today! Doesn't it make a difference! I really do hope he finds a home. He is far more white and twinkly in reality! He has FREE postage and packaging too and is much lower priced than he was originally on my website. The penny has finally dropped as to why you don't see many white bears.....they are a devil to photograph! Black bears too, which is a shame as both are such wonderful colours for bears. I really must get to grips with photographing the bears. Once my workroom is finished (at some point!) 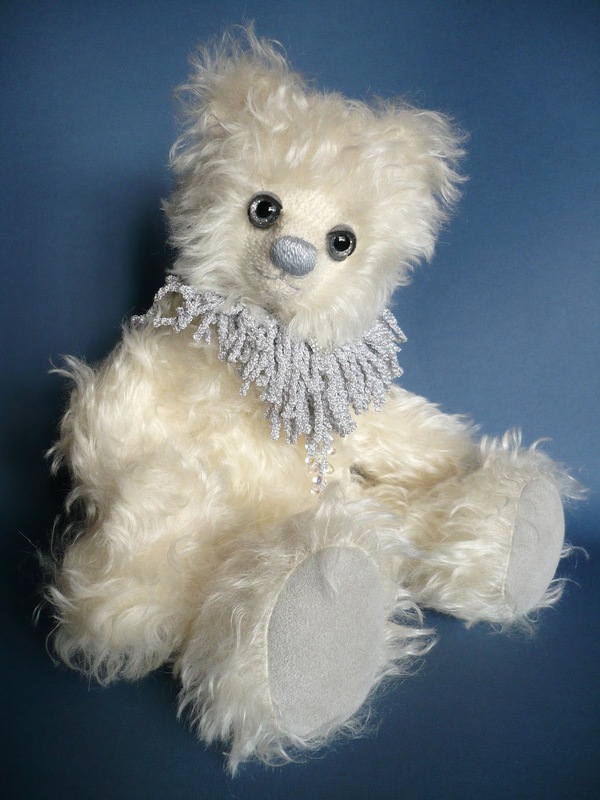 I would like to have an area that is always ready and set up to go for taking photos of new bears as they are created. Many a teddy bear artist has to contend with getting the lighting right or waiting for a bright day outside! Setting up of lights and backdrops, adjusting camera settings, posing the bears........cats walking into the frame. It's all very time consuming! Anyway, I digress. Hope you will pop along and visit Winter's auction. He's on ebay until the 4th March. Thanks for stopping by and I really do love your comments! For some time now I've wanted to put the bears and animals on etsy. I've always loved the look of it and thought it to be such a great vehicle for us artists to showcase our work. Well, I rolled up my sleeves and forged ahead and almost all the bears and animals are on there! Winter and Forest are yet to go on there, as I want to take better photos. Their photos have never done them justice. I spent many hours on Forest's collar with the beading and machine stitching and it just doesn't show up well enough. Cookie the mini bear is on there, BUT, he may appear on ebay. I'm still thinking about that one! The photos on etsy are lovely and big! I must remember that when I get around to re-doing my website. I seem to give my website a makeover once a year these days! Anyway, have a lovely weekend everyone. I hope the sun shines again like it did today! At long last I can show you Elliott! 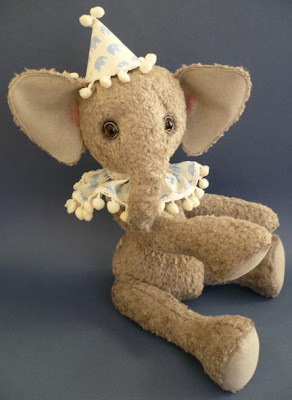 The very first elephant from me! It took a lot of fiddling around to try and get good photos of him and to be honest, I'm not overly pleased with these either, but I thought I would let him make a sneak preview, before he appears on my website. I'm really pleased with how he turned out. Seriously cute blue elephant fabric for his hat and ruff (removeable), all the way from Thailand!